CNYBrew.com: Oh yea, big grab! I just won this 100qt hoss on eBay for a steal at $38 with shipping. These things go for upwards of $100 new. This is going to allow us to brew up some BIG batches without the problems we have had in the past. Nice catch. That one should allow you to brew some really big brews. 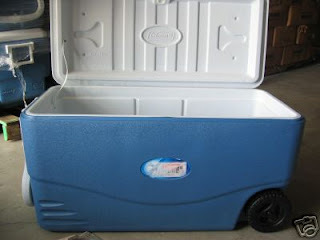 The Coleman Xtreme coolers are really nice. I have two of them myself (52qt and 70qt). Great to hear from you again. Yea we are pretty pumped about the possibilities that this creates.